A proper tone enricher - just leave it on to sound better or stomp on it for the next level. The most basic of the company’s wares. What is it about Denmark and classy pedals? We’ve had TC Electronic, Carl Martin and T-Rex. Now there’s LunaStone, founded in 2012 by head engineer, Steen Grøntved. It’s definitely on the up as TC Electronic’s VP of marketing and director of finance have recently migrated there. 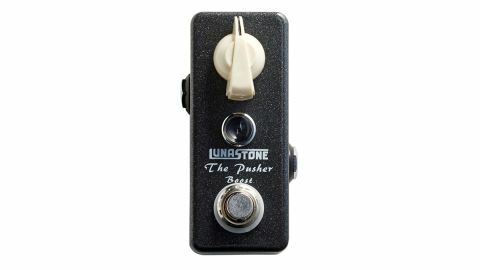 The Pusher is the company’s most basic pedal - a mini-sized booster based around a JFET circuit with just one chickenhead knob to dial in the amount of boost. Even with the knob at its lowest, there’s a pleasant shift in the sound with a touch of tonal enhancement in just the right area for clarity, and some compression offering extra punch, tempting you to keep the pedal permanently on. Turning the knob further increases the amount of boost up to up to about 15dB: more than enough to push an amp’s front end into overdrive or to add a gain stage to a dirt pedal.